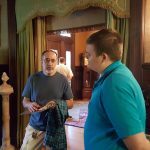 On Saturday, June 30, newly trained Junior Interpreters, along with veteran “J.I.s”, will give free tours of the McFaddin-Ward House and carriage house. Junior Interpreters are older teenagers who are fully trained docents. Junior Interpreter Day allows the new guides to become more proficient at interacting with guests of the museum. Beginning at 10 a.m., the group will be giving free tours to anyone who walks through the door, although it is best to secure a reservation. The teens will take a lunch break from 12 to 1 p.m. and begin afternoon tours after they eat. The last tour will start at 3:00. Feel free to drop by the museum or best, make your reservation today. J.I. Day is very popular with the public. The museum sees more than 100 people come for these free days.